Its Thursday and is time for reasons to be cheerful hosted by the lovely Mummy From The Heart if you want to join this fab linky click on the badge below. I am looking forward to the The London Onesie 5k London dash, for Comic Relief which i will be running in this Sunday, at the moment its forecast to rain, fingers crossed it holds off, but even if it does rain I'm sure it wont spoil the day. 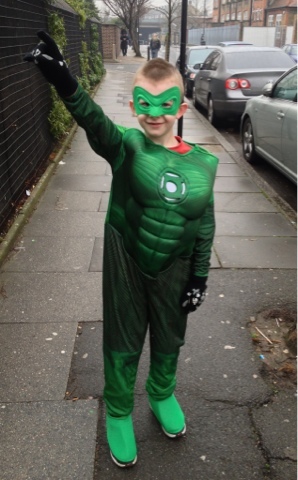 Ah, such a great Green Lantern! Have been reading your posts on fitness-well done! I really need to get motivated! Wonderful pic and it is so amazing how when we get these things right they are so thrilled. Great effort on the run front. Great costume - he looks the part.